If you are walking the Camino de Santiago, as you enter Galicia you will start noticing some interesting structures close to most homes in rural areas. These rectangular structures are granaries, called ‘hórreos’, and they are a very common construction across rural Galicia. Their function is to store grain and other food crops for the winter, keeping them dry and safe from animals, hence their slatted panels (usually in wood or stone) and height. Depending on the area, hórreos will have slightly different styles and use different construction materials (wood, carved granite stone, thatched, tiled or slate roofs, etc). Some hórreos also include roof decorations, from simple pointy carved stone to crosses or more elaborate figures. They are also known by different names, ‘hórreo’ being the most widespread; but ‘cabozo’ or ‘cabazo’ also being popular names. 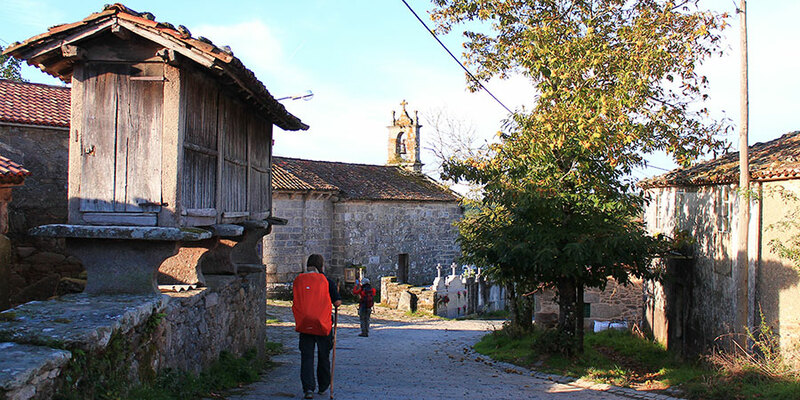 You will find hórreos mainly in Galicia; Northern Portugal, if you are following the Camino Portugues to Santiago; and Asturias, if you are walking the Camino del Norte or Camino Primitivo, where you will notice granaries are more square in shape. However, their function remains the same. You are also likely to find similar granaries in some parts of León and Cantabria. Hórreos are a common feature in Galicia’s countryside. The oldest reference to Galician hórreos comes from the 12th century book of poems Cantigas de Santa María, written by the King Alfonso X ‘El Sabio’ (nicknamed ‘The Wise Man’), so we know this classic examples of agricultural architecture have been in use in the area for many centuries. There are some impressive granaries across the land, one of the most famous being located in the village of Carnota, in the Costa da Morte, which is 35 metres long and dates back to the 18th century. *If you would like more information about the Camino de Santiago or to book your Camino holiday, contact our travel specialists.